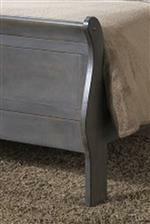 Slip away into sleep with this sophisticated sleigh bed. Curvaceous and shapely, this bed emanates a warm radiance with its presence. Subtle paneling on the head and footboard lend just the right touch of decorative detail to visually appeal, and arched end posts further the shapely, sweeping feel of the bed. Perfect for those looking to fashion a sophisticated, traditionally-styled bedroom, this sleigh bed offers just the right combination of little details and dramatic design to dress up your home. This bed is available in Twin, Full, Queen, and King sizes. The 4934A Queen Sleigh Panel Bed by Lifestyle at Beck's Furniture in the Sacramento, Rancho Cordova, Roseville, California area. Product availability may vary. Contact us for the most current availability on this product. Handles & Hardware Select pieces include hardware pulls. Case Construction Crafted from hardwood veneers & solids. Refine your bedroom with the classic styling of this bedroom collection. This assortment offers a traditional look and feel, including pieces such as a nightstand, dresser, mirror, and drawer chest. A beautiful sleigh panel bed lies at the heart of this collection, offering an elegant and sophisticated look for your master suite. Available in a rich Cherry, Black, or Grey finish, each piece has a soothing appearance, while simple moldings and beautiful hardware pulls add subtle detailing to the woodwork that is visually interesting and appealing. For those dreaming of a bedroom assortment with a design reminiscent of a more poised past, than let yourself sleep to dream with this bedroom collection. The 4934A collection is a great option if you are looking for Traditional furniture in the Sacramento, Rancho Cordova, Roseville, California area. Browse other items in the 4934A collection from Beck's Furniture in the Sacramento, Rancho Cordova, Roseville, California area.